As a rule, one should not panic at whatever crisis has momentarily fixed the attention of cable news producers. But the Ebola outbreak in West Africa, which has migrated to both Europe and America, may be the exception that proves the rule. There are at least six reasons that a controlled, informed panic might be in order. (1) Start with what we know, and don’t know, about the virus. Officials from the Centers for Disease Control (CDC) and other government agencies claim that contracting Ebola is relatively difficult because the virus is only transmittable by direct contact with bodily fluids from an infected person who has become symptomatic. Which means that, in theory, you can’t get Ebola by riding in the elevator with someone who is carrying the virus, because Ebola is not airborne. This sounds reassuring. Except that it might not be true. There are four strains of the Ebola virus that have caused outbreaks in human populations. According to the New England Journal of Medicine, the current outbreak (known as Guinean EBOV, because it originated in Meliandou, Guinea, in late November 2013) is a separate clade “in a sister relationship with other known EBOV strains.” Meaning that this Ebola is related to, but genetically distinct from, previous known strains, and thus may have distinct mechanisms of transmission. And even if this Ebola isn’t airborne right now, it might become so in the future. Viruses mutate and evolve in the wild, and the population of infected Ebola carriers is now bigger than it has been at any point in history—meaning that the pool for potential mutations is larger than it has ever been. As Dr. Philip K. Russell, a virologist who oversaw Ebola research while heading the U.S. Army’s Medical Research and Development Command, explained to the Los Angeles Times last week, I see the reasons to dampen down public fears. But scientifically, we’re in the middle of the first experiment of multiple, serial passages of Ebola virus in man. . . . God knows what this virus is going to look like. I don’t. In August, Science magazine published a survey conducted by 58 medical professionals working in African epidemiology. They traced the origin and spread of the virus with remarkable precision—for instance, they discovered that it crossed the border from Guinea into Sierra Leone at the funeral of a “traditional healer” who had treated Ebola victims. In just the first six months of tracking the virus, the team identified more than 100 mutated forms of it. Yet what’s really scary is how robust the already-established transmission mechanisms are. Have you ever wondered why Ebola protocols call for washing down infected surfaces with chlorine? Because the virus can survive for up to three weeks on a dry surface. How robust is transmission? Look at the health care workers who have contracted it. When Nina Pham, the Dallas nurse who was part of the team caring for Liberian national Thomas Duncan, contracted Ebola, the CDC quickly blamed her for “breaching protocol.” But to the extent that we have effective protocols for shielding people from Ebola, they’re so complex that even trained professionals, who are keenly aware that their lives are on the line, can make mistakes. By the by, that Science article written by 58 medical professionals tracing the emergence of Ebola—5 of them died from Ebola before it was published. (2) General infection rates are terrifying, too. In epidemiology, you measure the “R0,” or “reproduction number” of a virus; that is, how many new infections each infected person causes. When R0 is greater than 1, the virus is spreading through a population. When it’s below 1, the contamination is receding. In September the World Health Organization’s Ebola Response Team estimated the R0 to be at 1.71 in Guinea and 2.02 in Sierra Leone. Since then, it seems to have risen so that the average in West Africa is about 2.0. In September the WHO estimated that by October 20, there would be 3,000 total cases in Guinea, Liberia, and Sierra Leone. As of October 7, the count was 8,376. In other words, rather than catching up with Ebola, we’re falling further behind. And we’re likely to continue falling behind, because physical and human resources do not scale virally. In order to stop the spread of Ebola, the reproduction number needs to be more than halved from its current rate. Yet reducing the reproduction number only gets harder as the total number of cases increases, because each case requires resources—facilities, beds, doctors, nurses, decontamination, and secure burials—which are already lagging well behind need. The latest WHO projections suggest that by December 1 we are likely to see 10,000 new cases in West Africa per week, at which point the virus could begin spreading geographically within the continent as it nears the border with Ivory Coast. The word “widely” is key. Because despite the fact that Duncan was a lone man under scrupulous, first-world care, with the eyes of the entire nation on him, his R0 was 2, just like that of your average Liberian Ebola victim. One carrier; two infections. He passed the virus to nurse Pham and to another hospital worker, Amber Joy Vinson, who flew from Cleveland to Dallas with a low-grade fever before being diagnosed. (3) Do you really want to be scared? What’s to stop a jihadist from going to Liberia, getting himself infected, and then flying to New York and riding the subway until he keels over? This is just the biological warfare version of a suicide bomb. Can you imagine the consequences if someone with Ebola vomited in a New York City subway car? A flight from Roberts International in Monrovia to JFK in New York is less than $2,000, meaning that the planning and infrastructure needed for such an attack is relatively trivial. This scenario may be highly unlikely. But so were the September 11 attacks and the Richard Reid attempted shoe bombing, both of which resulted in the creation of a permanent security apparatus around airports. We take drastic precautions all the time, if the potential losses are serious enough, so long as officials are paying attention to the threat. (4) Let’s put aside the Ebola-as-weapon scenario—some things are too depressing to contemplate at length—and look at the range of scenarios for what we have in front of us, from best-case to worst-case. The epidemiological protocols for containing Ebola rest on four pillars: contact tracing, case isolation, safe burial, and effective public information. On October 14, the New York Times reported that in Liberia, with “only” 4,000 cases, “Schools have shut down, elections have been postponed, mining and logging companies have withdrawn, farmers have abandoned their fields.” Which means that the baseline for “best-case” is already awful. In September, the CDC ran a series of models on the spread of the virus and came up with a best-case scenario in which, by January 2015, Liberia alone would have a cumulative 11,000 to 27,000 cases. That’s in a world where all of the aid and personnel gets where it needs to be, the resident population behaves rationally, and everything breaks their way. The worst-case scenario envisioned by the model is anywhere from 537,000 to 1,367,000 cases by January. Just in Liberia. With the fever still raging out of control. By which point, all might well be lost. Anthony Banbury is coordinating the response from the United Nations, which, whatever its many shortcomings, is probably the ideal organization to take the lead on Ebola. Banbury’s view is chilling: “The WHO advises within 60 days we must ensure 70 percent of infected people are in a care facility and 70 percent of burials are done without causing further infection. . . . We either stop Ebola now or we face an entirely unprecedented situation for which we do not have a plan [emphasis added]”. What’s terrifying about the worst-case scenario isn’t just the scale of human devastation and misery. It’s that the various state actors and the official health establishment have already been overwhelmed with infections in only the four-digit range. And if the four pillars—contact tracing, case isolation, safe burial, and effective public information—fail, no one seems to have even a theoretical plan for what to do. (5) And by the way, things could get worse. All of those worst-case projections assume that the virus stays contained in a relatively small area of West Africa, which, with a million people infected, would be highly unlikely. What happens if and when the virus starts leaking out to other parts of the world? It isn’t crazy to see how a health crisis could beget all sorts of other crises, from humanitarian, to economic, to political, to existential. If you think about Ebola and mutation and aerosolization and R0 for too long, you start to get visions of Mad Max cruising the postapocalyptic landscape with Katniss Everdeen at his side. (6) While we’re on the subject of political crisis, it’s worth noting that the politics of Ebola are uncertain and dangerous to everyone involved. Thus far, there’s been only one serious political clash over Ebola, and that’s concerning the banning of flights to and from the infected countries in West Africa. The Obama administration refuses to countenance such a move, with the CDC’s Frieden flatly calling it “wrong”: A travel ban is not the right answer. It’s simply not feasible to build a wall—virtual or real—around a community, city, or country. A travel ban would essentially quarantine the more than 22 million people that make up the combined populations of Liberia, Sierra Leone, and Guinea. When a wildfire breaks out we don’t fence it off. We go in to extinguish it before one of the random sparks sets off another outbreak somewhere else. We don’t want to isolate parts of the world, or people who aren’t sick, because that’s going to drive patients with Ebola underground, making it infinitely more difficult to address the outbreak. . . .
Not terribly convincing, is it? Wildfires, in fact, are often fought by using controlled burns and trench digging to establish perimeters. And it’s a straw-man argument to say that a flight ban wouldn’t keep Ebola fully contained. No one says it would. But by definition, it would help slow the spread of the virus. If there had been a travel ban in place, Thomas Duncan would have likely reached the same sad fate—but without infecting two Americans and setting the virus loose in North America. And it’s difficult to follow the logic by which banning travel from infected countries would create more infections in the United States, as Frieden insists. This is not a paradox; it’s magical thinking. Frieden’s entire argument is so strange—and so at odds with what other epidemiologists prescribe—that it can only be explained by one of two causes: catastrophic incompetence or a prior ideological commitment. The latter, in this case, might well be the larger issue of immigration. Ebola has the potential to reshuffle American attitudes to immigration. If you agree to seal the borders to mitigate the risks from Ebola, you’re implicitly rejecting the “open borders” mindset and admitting that there are cases in which government has a duty to protect citizens from outsiders. Some people on the left admit to seeing this as the thin end of the wedge. Writing in the New Yorker, Michael Specter lamented, “Several politicians, like Governor Bobby Jindal, of Louisiana, have turned the epidemic into fodder for their campaign to halt immigration.” And that sort of thing just can’t be allowed. What would happen in the event of an Ebola outbreak in Latin America? Then America would have to worry about masses of uninfected immigrants surging across the border—not to mention carriers of the virus. And if we had decided it was okay to cut off flights from West Africa, would we decide it was okay to try to seal the Southern border too? You can see how the entire immigration project might start to come apart. So for now, the Obama administration will insist on keeping travel open between infected countries and the West and hope that they, and we, get lucky. At a deeper level, the Ebola outbreak is a crisis not for Obama and his administration, but for elite institutions. Because once more they have been exposed as either corrupt, incompetent, or both. On September 16, as he was trying to downplay the threat posed by Ebola, President Obama insisted that “the chances of an Ebola outbreak here in the United States are extremely low.” Less then two weeks later, there was an Ebola outbreak in the United States. We have arrived at a moment with our elite institutions where it is impossible to distinguish incompetence from willful misdirection. This can only compound an already dangerous situation. An earlier version of the page is still available in Google's cache. It said that while Ebola is not "airborne" like chickenpox or tuberculosis, it can travel a few feet in the air inside droplets emitted when someone coughs or sneezes. "A person might also get infected by touching a surface or object that has germs on it and then touching their mouth or nose," the document said. Can Ebola spread by coughing? By sneezing? Unlike respiratory illnesses like measles or chickenpox, which can be transmitted by virus particles that remain suspended in the air after an infected person coughs or sneezes, Ebola is transmitted by direct contact with body fluids of a person who has symptoms of Ebola disease. Although coughing and sneezing are not common symptoms of Ebola, if a symptomatic patient with Ebola coughs or sneezes on someone, and saliva or mucus come into contact with that person’s eyes, nose or mouth, these fluids may transmit the disease. The version of the Q&A still online notes that Ebola can survive on doorknobs for several hours. The removed question is available in Google's cache from Oct. 29. I seem to remember posting an excel spreadsheet to the first post that looks a lot like the one in this article. Their date for worldwide exposure is about 10 months later than mine, but they reached the same conclusion: if the rate holds constant, it's only a matter of time. Background: An Ebola outbreak of unparalleled size is currently affecting several countries in West Africa, and international efforts to control the outbreak are underway. However, the efficacy of these interventions, and their likely impact on an Ebola epidemic of this size, is unknown. Forecasting and simulation of these interventions may inform public health efforts. 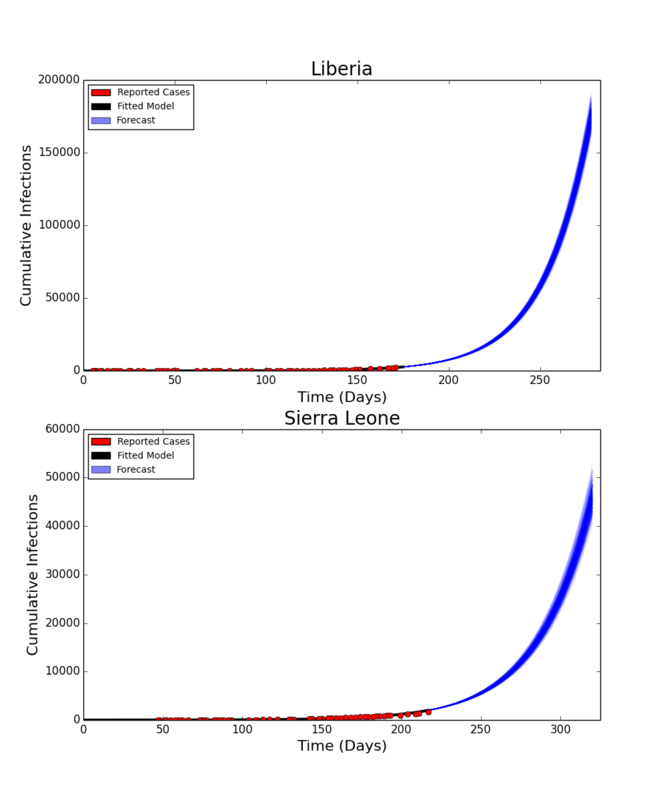 Methods: We use existing data from Liberia and Sierra Leone to parameterize a mathematical model of Ebola and use this model to forecast the progression of the epidemic, as well as the efficacy of several interventions, including increased contact tracing, improved infection control practices, the use of a hypothetical pharmaceutical intervention to improve survival in hospitalized patients. That's a point well spoken Kalleh but there's quite obviously a media blackout going on and I am still at least attempting to get updated numbers for my own models. NOTE: this is even faster than the graphs I posted above. The U.S. Is now going to start screening people from Mali in response. Like a fractal is the slow-but-ever-hastening steady spread of this disease. 1) with the puppet show elections over with and ferguson on the news don't you find it odd that he number of deaths has purportedly stayed 5000 for the last few weeks? It's quite obvious there is a media black out going on. Probably to keep the sheeple buying big screen tvs on Black Friday at Walmart on fake data about the economy booming. 2) Almost all the pieces are in position for a world war - Russia, Ukraine, Syria, China. Will the U.S. allow the spread of ebola so they can use it to scapegoat the stock market crash? Or will they false flag attack the stock market and then scapegoat Russia and/or China and use it as an excuse to go to war? 3) In case you didn't read it on the news, that African national surgeon they brought into the U.S. died within a day of arriving. Which begs the question: if he was so sick that he couldn't even walk off the plane then why was he brought here? If I didn't know any better I'd say it almost feels like they are importing sick people to spread it. "The toll in the Ebola epidemic has risen to 5,420 deaths out of 15,145 cases in eight countries, the World Health Organization (WHO) said on Wednesday, with transmission of the deadly virus still "intense and widespread" in Sierra Leone. The figures, through Nov. 16, represent a jump of 243 deaths and 732 cases since those issued last Friday, and cases continue to be under-reported, the WHO said in its latest update." If my math is correct, that's 732 cases divided by 5 days. At 146.4 new cases per day, that's 1024 new cases per week. Now bear in mind the 2.5X underreporting factor. So, we're really talking a current spread of around 2500 per week. And with it doubling every 21 days, that means by Dec 10 it'll be 5000 new cases per week and by Dec 31 it'll be 10000 new cases per week. Notice how the BBC isn't afraid to say there are around 14,000 infected? I haven't heard any numbers near that coming from US sources. The media blackout is in full swing. I strongly recommend continuing to prep with any spare funding you have. Shore up your weak spots now. This is a current graph showing where we're at. The scary part is where the graph is headed.